Stans means “upright” as this is a bush, rather than a vine. (OK, we’ve put this in the vine category and it’s not a vine. 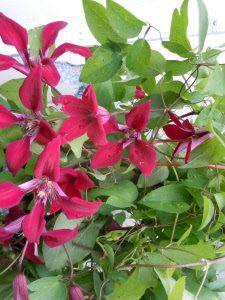 But most people think of Clematis as vines and we didn’t want you to miss it.) In Japan called “Kusa-botan.” Collected by Ernest Henry ‘Chinese’ Wilson before 1910. 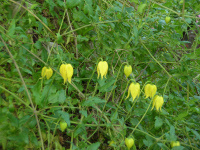 Small yellow flowers bloom for months, from July to September, then turn into ornamental spidery seed heads. Care: Sun - part shade in moist well-drained to well-drained soil. Prune close to the ground in spring. The genus Clematis was named by Dioscordes, physician in Nero’s army, from klema meaning “climbing plant.” Sixteenth century English herbalist John Gerard called Clematis “traveler’s joy” because of the joy given to travelers by the beauty of the flowers. 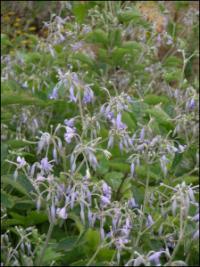 This species, C. tangutica introduced to western cultivation in 1898 when it was sent to Kew Gardens from St. Petersburg, Russia, after its discovery in Tibet. 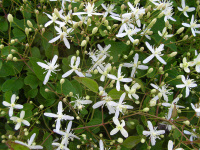 Fragrant, small white blossoms smother this vigorous vine in September and October. Care: Sun moist well-drained soil mulched. Flowers on current year’s wood. Cut back in early spring to 6-8” above the soil. The genus Clematis was named by Dioscordes, physician in Nero’s army, from “klema” meaning climbing plant. In 1877 seeds of this vine sent from Russia to the Arnold Arboretum in Boston, then distributed to nurseries throughout America. Care: Full sun in humusy, fertile, moist well-drained soil. Mulch around the base. Flowers on current year’s stems so cut back to 6-8” in late winter or early spring.